The MolE PhD program will match students with faculty advisors based on their research interests. Advisors will be selected from among the Molecular Engineering & Sciences Institute faculty listed below. Our group develops methods in the theory and computational modeling of nanoscale devices, and applies them to emerging technologies. In particular, we are interested in emerging devices where quantum mechanics plays a fundamental role in determining device behavior. Such devices have the potential to impact the fields of low power electronics and bio/chemical sensing technologies. We use both methods developed by us and other groups to design and simulate nanodevices and explain experiments. Our current research involves charge transport in (i) emerging memory devices where atom movement is central to information storage, (ii) bio nanostructures (DNA and peptides), (iii) molecular nanostructures and (iv) solar cells. Our research group focuses on both the fundamental thermodynamics and structural features associated with biorecognition phenomena and practical applications in drug and protein design. The primary biophysical tools employed are spectroscopic: NMR determinations of polypeptide structure and dynamics, IR- and fluorescence-monitored T-jump kinetics for folding pathways, CD studies of the melting of secondary and tertiary structure. Our lab studies the mitotic spindle, a molecular machine that organizes and separates duplicated chromosomes during cell division, thereby ensuring equal partitioning of the genetic material. To uncover how this machine operates, we are reconstituting spindle functions using pure components and applying new biophysical tools for manipulating and tracking individual molecules, such as laser trapping and ultrasensitive fluorescence microscopy. Our lab studies enzymes and proteins that participate in the detoxification of foreign chemicals, including therapeutic drugs. We are also studying therapeutic antibodies, other pharmaceutically important proteins, and several classes of nanoparticles to understand structure-function aspects of their tissue targeting, clearance, and in vitro stability. Professor Baker’s research aims to predict the structures of naturally occurring biomolecules and interactions and to design new molecules with new and useful functions. Building on intial computational designs, Baker uses experiment to better understand the principles underlying catalysis and binding in order to design novel proteins and enzymes. The Baliga Lab develops predictive models to explain, predict and manipulate complex biological behaviors in order to catalyze strategies for personalized medicine, formulating effective therapies for tuberculosis, and crafting solutions for a sustainable environment. Interaction with the environment is central to how information within our DNA is decoded into observable phenotypes. Dr. Baliga and his laboratory are using a multidisciplinary systems approach to understand this process. Once delineated, the engineering principles governing assembly of biological systems will help unlock potentials within diverse organisms, and enable spectacular solutions for problems in environment, global health and medicine. Our research aims to improve the expression and folding of heterologous proteins in Escherichia coli, develop innovative sensors and sensing strategies, and build proteins capable of controlling the nucleation, growth, crystallography, assembly and reconfiguration of hybrid organic-inorganic-synthetic materials at the nanoscale. MolES-related research interests: Molecular design and engineering through application of machine learning and Data Science methodologies. Bioprospecting for new molecules and industrial microbes. MolES-related education interests: Data Science, scientific software design & engineering, reproducible computational research. Optimization of adhesion and mechanical properties in particle and fiber reinforced polymeric composites. Particle charging in and electrical properties of colloidal dispersions in apolar media. Rheology and rheology modification in dense colloidal dispersions. The Berndt lab develops fluorescent biosensors for optogenetic approaches by utilizing structure guided and high throughput protein engineering. We aim to detect the activity of neurotransmitter, neuromodulators, hormones, ions and intracellular signaling molecules in life tissue and behaving animals. These sensors will provide multidimensional real time information of the current state of neurons and neuronal networks. Our goal is to identify impaired network dynamics in rodent models for neurological disorders. However, these protein tools are universally applicable and we seek to expand applications into other cell types such as cardiac, pancreatic and stem cells. My main research interest is the application of quantum many-particle theory to physical systems. The particular areas of current research are nuclear structure and reactions and electronic excitations of molecules and condensed matter. In our lab, we work on many aspects of micro and nano electro mechanical systems (MEMS / NEMS). This research tends to be very interdisciplinary, and we have collaborations in biology, chemical engineering, bioengineering, computer science, and other departments. We have built, for example, self-assembling microstructures, biomedical implants, systems for docking of picosatellites, and walking microrobots. Our team’s research focuses on developing functional macromolecules capable of mechanochemical transduction. We explore fundamental aspects of how mechanical forces are distributed throughout polymeric and nanoscale structures, and how those forces can be harnessed to direct site-specific chemical reactivity. Using this knowledge, we engineer molecules to perform functions such as on-demand release of therapeutics or self-reinforcement of crosslinked networks. My research interests focus on modeling: (1.) ultra-thin film hydrodynamics at scales down to the nanometer range, including foams and films consisting of complex fluids and nanoparticles. Applications are liqhtweight materials for energy conservation, coatings and sensors. (2.) Nanoparticle nucleation and growth processes, quantum dot dynamics, nanostructural evolution, for device and biomedical applications. The Bush Lab works at the interface of analytical and biophysical sciences. We develop mass spectrometry and ion mobility spectrometry technologies that provide novel insights into structures and assembly of biomolecular machines and biotherapeutics, and apply these technologies to targets that are heterogeneous, dynamic, and interact with complex chemical matrixes. Improving catalysts could minimize the use of fossil fuels, thus helping solve the energy crisis while decreasing greenhouse gases. Our group tries to clarify why catalyst modifiers act to promote catalytic activity or selectivity, and how nanoscale features of the catalyst surface can tuned to make better catalysts. In solar cells and LEDs, charge injection and extraction occurs at the interface between a metal or other conductor and one of the semiconducting materials (inorganic materials in most current commercial devices, but hopefully cheaper-to-make polymer films in the future). We also study the energetics and electronic properties of these interfaces. My laboratory focuses on pathogen detection in clinical and environmental samples, and epidemiology of infectious diseases. Relevant areas including tuberculosis (TB) and related diseases, food- and water-borne pathogens, and healthcare-associated infections. These activities share a strong emphasis on translation and global health impact. Recent accomplishments include the development of a novel, oral swab-based TB case finding approach, new molecular viability testing methods, and new semi-synthetic affinity reagents for molecular diagnostic testing. These efforts are being carried out in collaboration with researchers in the U.S., South Africa, Kenya, and Bangladesh. Our research is focused on processing and characterization of nanostructured materials, and their energy related application like dye sensitized solar cell, organic-inorganic hybrid solar cell, lithium battery, supercapacitor and hydrogen storage. Our processing techniques include sol-gel processing, hydrothermal growth, electrochemical and electrophoretic deposition, and self-assembly. The research emphasis is to achieve novel structure and properties of energy related nanostructured materials through processing and composition designing. Our goal is to develop design platforms for engineering complex genetic control systems for fundamental and applied synthetic biology. In our work, we combine computational modeling, in vitro selection and genetic engineering to construct RNA-based systems that can process cellular information and program the expression levels of large numbers of genes. Our aim is to enable both better understanding of fundamental biological processes and applications to meet demands for renewable chemicals and new therapies. Our research is directed at obtaining detailed information about the surface composition and structure of biomaterials and the interaction of biomolecules with those biomaterials. Recent advances have made it possible to control chemistry on a local scale undreamed of only a few years ago. The dimensions of the lateral chemical variations are diminishing, the complexity of the molecules being introduced at the surface is increasing, and the manipulations of the surface moieties become ever more sophisticated. These advances offer great challenges and opportunities for biomedical surface analysis. Protein engineering using a combination of synthetic protein chemistry and molecular biology. We are generally interested in developing novel chemical approaches to site-selectively modify proteins in order to understand their regulation by reversible post-translational modifications. We are currently working in two areas, interrogating mechanisms of gene regulation by histone modifications and studying protein degradation pathways in tuberculosis. We also collaborate with several groups on campus to study biomedically relevant proteins. Our research is focused on developing new methods for probing complex biological processes at the single-cell and single-molecule level, and on applying these new techniques for addressing pressing biological problems. Please visit our website for more details. 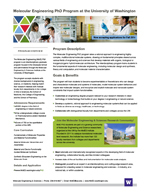 The main focus of our group is in nanoengineering for low cost, rapid diagnosis of diseases. The research fields cover from the discovery of fundamental sciences for a tip enrichment method using an electric field to the development of a biomedical device for low cost, rapid diagnosis of diseases. We have developed the tip sensor technology that enriches and detects molecules on a nanoscale tip. The innovation of this technology is in the superior enrichment mechanism on the basis of an electric field, chemical binding affinity, and capillary action. The unusual enrichment performance using a nanotip enables high throughput, low cost diagnosis of diseases. This innovative technology has been developed for low-cost screening of tuberculosis and highly sensitive detection of protein and other biomarkers. We study the physics governing nanoscale systems, in particular nanowires, nanotubes and two-dimensional materials like graphene and transition-metal dichalcogenides. Most of our nano-objects are grown in our lab, and they are then built into various kinds of devices using micro- or nano-fabrication techniques. We are particularly interested in low-dimensional physics, many-body effects, phase transitions, and unusual electronic excitations. We work very closely with the Nanoscale Optoelectronics Lab of Professor Xiaodong Xu and exploit low-temperature expertise of Professor Oscar Vilches. We are motivated by curiosity, but we hope our work will be relevant to applications in sensing and to storage and transfer of charge, energy and information. My laboratory is using computational and experimental methods to design diagnostic and therapeutic agents to target amyloid diseases, which are reaching epidemic proportions as human lifespan increases. The Dalton group's research focuses on the interdisciplinary field of materials chemistry with particular emphasis on high technology electronic, electro-optic, and nonlinear optical materials and emphasis on nanoscale materials and architectural construction techniques. Our team seeks to integrate the governing principles of rational design with fundamental concepts from material science, synthetic chemistry, and stem cell biology to conceptualize, create, and exploit next-generation materials to address a variety of health-related problems. We are currently interested in the development of user-programmable biomaterials for assaying dynamic stem cell fate and tissue engineering applications, controlled therapeutic delivery to combat disease, and new tools for enhanced proteomic studies. Our work relies heavily on the utilization of cytocompatible bioorthogonal chemistries, several of which can be initiated with light, to control material properties on the molecular level. Applied research has focused on the use of inversion-based approaches to solve challenges in nano (and sub-nano) scale precision positioning needed in scanning probe microscopes such as the atomic force microscope (AFM) and the scanning tunneling microscope (STM). It is noted that the AFM and STM are key enabling tools in the nano area; therefore the current work aimed at increasing their throughput will have a significant impact on the real-time investigation and manipulation of nano-scale and sub-nano-scale phenomena. For example, the inability to precisely position an AFM probe (at high speed) over a cell surface has traditionally limited the ability to image time-varying dynamics of cellular processes. In particular, lack of precision positioning (due to movement-induced vibration) leads to excessive forces on the cell surface (as the probe digs into the cell) and causes sample damage. Therefore, current AFM imaging of cells is limited to low operating speeds. Our research group was the first to demonstrate (experimentally) that feedforward techniques can effectively compensate for movement-induced vibrations in Scanning Probe Microscopes. Thereby, we showed that feedforward inputs could be used to increase the operating speed of Scanning Probe Microscopes. See website for further information. We are interested in a number of biophysical chemistry studies, with two particular foci: the structural and dynamic interactions of biomineralization peptides and proteins with relevant non-protein surfaces, and the specific role of dynamics in protein–nucleic acid recognition. Our primary approach is solid state nuclear magnetic resonance (SSNMR) spectroscopy, supported by computational and synthetic techniques. Professor Dunham’s MolES-related interests lie in modeling and simulation of chalcopyrite (CIGS and CZTS), silicon and polymer photovoltaics. Efforts within the Nanotechnology Modeling Laboratory are focused on obtaining basic understanding of nanofabrication processes and device operation and applying that knowledge to produce better models, simulators, and devices. We design and use microfluidic devices to better mimic the real microenvironment of nerve and cancer cells when we culture them outside of the organism. We are microfluidic! Examples of questions that interest us are how neurons find their targets during development (axon guidance), how they establish their connections (synaptogenesis), and how we sense odors (olfaction), among other projects. We also build microfluidic devices that allow us to personalize chemotherapy and devices to study cancer stem cells. In the Optical Spintronics and Sensing Lab we study the quantum properties of point defects in crystals. In high purity crystals, simple quantum systems exhibiting a high level of quantum coherence can be realized. Dr. Gamble’s research focuses on surface modification and characterization of model biomedical systems including fundamental research towards the preparation and characterization of DNA and protein microarrays. She is also involved in the development of new techniques that will enable improved analysis of the biomolecule-surface interface and improved chemical imaging of biologically relevant samples. Professor Gamelin’s research targets the development and physical characterization of new functional inorganic materials, with particular focus on semiconductor nanostructures and thin films for photophysics, spin-photonics, and solar energy conversion. Our group designs and develops functional materials and structures on the nanometer scale. Examples include multicolor quantum dots for fluorescence imaging, magnetic nanoparticles for MRI, metallic nanoparticles for ultrasensitive detection, and polymeric nanoparticles for targeted drug delivery. Most recently, we are developing multimodality imaging probes by combining different materials into discrete nanostructures in order to utilize the strength of each individual component. Our lab studies the ecology and evolution of microbial communities. In particular, we are interested in how host-associated bacterial communities influence the health and wellness of the host organism. We design computational and wet-lab tools for studying these complex systems. Ultimately, we aim to develop targeted ecological therapeutics for engineering the ecology of the gut microbiome to improve human health. The Ginger Research Group pioneers techniques such as time-resolved electrostatic force microscopy (trEFM) and photoconductive atomic force microscopy (pcAFM) to study nanostructured solar cells, energy efficient light-emitting diodes, and biosensors. Our team addresses the increased interplay between physical organic chemistry and material science that will undoubtedly give rise to the next generation of advanced macromolecules for applications in biomedicine and engineering. Rooted in structure and mechanism, work in the group tackles challenges in macromolecular synthesis across a variety of scales. Some representative goals include the development of novel methods to access cyclic polymers, the development of new approaches towards reconfigurable polymer networks, and the construction of force-responsive soft materials. Students will be trained across organic synthesis and polymer chemistry, with ample opportunity for cross-disciplinary collaboration involving bioengineering and materials science! We aim to understand the molecular interactions between membrane lipids and membrane proteins. Using ion channels regulated by signaling lipids, we study how lipid binding alters the structure and function of channels. Our lab focuses on the structural analyses of glycoproteins and carbohydrate - protein interactions. We also develop new technologies for characterization and tracking of carbohydrates by mass spectrometry that sometimes includes instrument modification and software development. Professor Hillhouse’s research is focused on the molecular science and engineering of clean energy conversion devices. In the area of solar cells, research topics in his group span the range from fundamental studies of semiconductor nanocrystal growth, colloidal and interfacial chemistry, nanostructure self-assembly, and semiconductor defect chemistry to the development of novel device architectures that will enable roll-to-roll printing of low-cost high-efficiency solar cells from molecular and nanocrystal-inks. Research interests: Nano-scale functional devices with emphasis on active engineering membranes; fluidic and ionic transport studies in nano-pores; biomimetic nanoporous platforms with active gatekeepers; biochemical separations and programmed enzymatic membrane reactors; electro-catalytic flow reactor material systems. Intracellular drug delivery; Smart polymers & hydrogels; Smart polymer-biomolecule conjugates in drug delivery; Separations & diagnostics. Our research group is focused on the large-scale production of nanocrystals and nanowires synthesized by scalable solution-based and supercritical fluid-based processes for energy conversion and energy storage applications, with an emphasis on nanomaterial growth, assembly, and in situ electron microscopy. Alex Jen is Professor Emeritus of the Department of Materials Science & Engineering at the UW. He received his Ph.D. degree in Chemistry from the University of Pennsylvania in 1984. His research centers on the design and synthesis of functional polymers for photonic and energy applications. Jen has been recognized as a Fellow by MRS, ACS, PMSE, OSA, SPIE, and AAAS, and has faculty appointments in Taiwan, China, and Korea. He was on the Board of Directors of the WA Technology Center and is a member of the WA Academy of Sciences. He is currently Provost at the City University of Hong Kong. Our research is focused on the molecular engineering of organic and polymeric materials for electronic, photonic, and energy applications. Our studies include synthesis, processing, self-assembly, structure-property relationships, photophysics, and charge transport of organic and polymer semiconductors. Ongoing device engineering applications include thin film transistors, photovoltaic cells, light emitting diodes, and photodetectors. Dr. Jiang’s research is on biointerfaces, biomaterials and biosensors, particularly the molecular understanding, design and development of zwitterionic functional materials. His work spans from molecular principles to product development for a wide range of applications such as medical devices, nanoparticles for diagnostics and drug delivery, antimicrobial coatings and marine coatings. Crystals are in the center of research, a) for deriving molecular structures via single crystal X-ray diffraction, as part of service to the Chemistry Department, or for the purpose of calculations of optical properties, b) for the experimental study of crystal-optical features as in optical rotation, electro-optic responses or simple birefringence. Devices for measuring those features are custom build and, in case of birefringence, made available via licensing through the center for commercialization as software/blueprint combinations. Our lab investigates a wide range of questions concerning self-assembly, complex fluids, and soft matter systems, with a focus on lipid membrane biophysics and origins of life. A recurring research theme in the group is how simple lipid mixtures within bilayer membranes give rise to complex phase behavior. The Khalil group seeks to understand charge transfer processes in solution at a microscopic level. One of our goals is to correlate electronic and atomic motion on ground and excited electronic surfaces. We use and develop various nonlinear spectroscopies employing ultrafast light pulses across the electromagnetic spectrum from Infrared (8 microns) to X-ray (0.4 nm) wavelengths. Through the use of multi-scale fabrication and integration tools, the Kim Laboratory focuses on the development and applications of biomimetic cell culture models and functional material-cell/tissue interfaces for elucidating cell biology, high-throughput drug screening, stem cell-based therapies, disease diagnostics, and medical device development. Our long-term goals are to better understand complex cellular behavior in response to microenvironmental cues in normal, aging and disease states, to gain new mechanistic and molecular insights into the control of cell-tissue structure and function, and to develop multiscale regenerative technologies for improving human health. The Klavins Lab uses tools and methodologies from electrical engineering and computer science to develop detailed mechanisms that will inform the development of novel biological systems in the emerging field of synthetic biology. Topics of research interest include gene expression, auxin signal processing, synthetic multi-celled systems, and directed evolution. Dr. Korshin's research interests include corrosion and metal release in drinking water, environmental electrochemistry, advanced oxidation processes, development of new approaches to quantify and model the degradation of pharmaceuticals and other trace-level organic contaminants in wastewater, characterization of natural organic matter and its reactions with halogens, on-line methods to monitor drinking water quality and environmental chemistry of radionuclides. He has published almost a hundred refereed publications, many of them in leading journals such as Water Research and Environmental Science & Technology. Prof. Korshin has participated in numerous projects funded by Water Research Foundation, Water ReUse Foundation, National Science Foundation, U.S. Environmental Protection Agency and other organizations. Materials Science with emphasis on nanoscale magnetic and transport (both charge and spin) phenomena in reduced dimensions, including their inter-coupling, to develop new paradigms for materials and devices in the context of novel information (storage, processing and logic) and energy technologies. And Bioengineering at the intersection of Magnetism, Materials and Medicine focusing on diagnostics, imaging and therapy, with appropriate translational research and commercialization activities. Our lab studies how immune cells make fate decisions, both as they develop from stem cells, and as they respond to antigens. We combine live cell imaging, mathematical modeling and other modern approaches to dissect the molecular circuitry underlying fate control at the single cell level. Our work will lay foundations for engineering immune cells to treat cancer and other life-threatening diseases. Our group is devoted to investigating the mechanics and physics of multifunctional materials and systems using tightly combined theoretical, numerical, and experimental investigations. We are interested in understanding the formation and evolution of microstructure in materials, clarifying their structure-property relationship, and optimizing microstructures and processing conditions for superior functional properties. We have been working on ferroelectrics, ferromagnetic materials, multiferroics, thermoelectrics, and electro-active polymers and composites, and we are currently focusing on global energy need through multifunctional materials design and synthesis. We are also probing electromechanical coupling in biological systems using piezoresponse force microscopy, with which we recently discovered biological ferroelectricity in soft tissues. Our research focus on computational design and search for stable and controllable nano-sized semiconducting materials. Specifically, our research focuses on (i) the roles of defects, such as transition-metal and p-type dopants, in activating high Curie-temperature ferromagnetism; (ii) charge-transfer transitions for potential solar energy conversion; (iii) chemical and physical processes required to control magnetization using time-dependent quantum mechanical electrodynamics of charge-transfer delocalization, magnetic polaron formation, and magnetization reversal dynamics; and (iv) dopant-centered Auger-type processes and their role in the photodynamics of these doped nanocrystals. Research in Dr. Lidstrom’s laboratory is focused on genome-scale analyses and manipulations of the metabolic network in methylotrophic bacteria, which are capable of growth on methane, methanol, and methylated amines. The long-term goal of this research is to develop environmentally sound and economically viable alternatives to current chemical production strategies, including conversion of natural gas to liquid fuels (Gas-To-Liquid technology). Our group studies and utilizes three-dimensionally confined nanoparticles such as colloidal quantum dots (QD) and plasmonic nanoparticles (NP) to build various nanophotonic devices. These materials harvest strong near-field interaction with light, and have opened new directions in nanophotonic devices and integration, as well as various applications in biomedicine and nanotechnology. We investigate light detection, harvesting, stimulation of cells and trapping using nanostructures. In addition, we also pursue device integration in micro-scale utilizing optical MEMS technology. Jonathan Liu's research interests are nanoparticle contrast agents, molecular imaging, biophotonics, immunofluorescence microscopy, in vivo microscopy, 3D microscopy, and cancer biomarkers. MolES-related research interests: Many human diseases can be diagnosed by biochemical analysis of blood, saliva, urine, or other fluids. Our group creates new tests to diagnose disease by engineering assay chemistries and devices, with an emphasis on nucleic acid assays (DNA and RNA). We aim to make easy-to-use tests for global health settings or non-laboratory settings in high-income locations. The group is actively involved in entrepreneurship, industry collaboration, and translation for global health settings. MolES-related education interests: Global Health Technologies: Molecular Diagnostics - a bioengineering course covering the basics of amplification-based DNA & RNA detection for disease diagnosis, the underlying engineering principles, and applications in the context of global health. The Maibaum Group uses the tools of computational modeling and statistical mechanics to understand mechanisms of biophysical processes and to design novel biomimetic materials. One focus of our work is the emergent spatial organization of cellular membranes and their response to external stimuli such as bending or protein binding. Another recent example is the incorporation of azobenzene groups into DNA, which allows control over DNA hybridization and opens a new route towards designing photo-responsive materials. Our research is focused towards developing new nanophotonic devices where we can engineer light-matter interaction to enable few photon optoelectronics. Our group aims to understand and control the enzyme families involved in intracellular signal transduction. The final goal of these studies is to identify new molecular targets for the treatment of human disease. We integrate techniques from organic chemistry, biochemistry, protein engineering, proteomics, and cell biology to develop new tools that provide a greater understanding of diverse signaling processes. Our technological innovations seek to address the limitations of currently existing methods for studying these highly dynamic cellular events. Furthermore, we are using these tools to answer a number of fundamental questions in biology. The goal of our research is to create new sensor and automation technology applications in such fields as non-destructive testing, power engineering, and manufacturing control using latest advances in signal processing, robotics, and communications. We are particularly interested in developing energy-efficient electrohydrodynamic air movers and using dielectric spectroscopy for non-destructive testing and forensics. Professor Masiello's research focuses on the theoretical understanding of a variety of nanoscale light-matter interactions involving the excitation of surface plasmon resonances. Examples include electron energy-loss spectroscopy, cathodoluminescence, thermo-plasmonics, plasmon-enhanced catalysis, and plasmon-enhanced linear and nonlinear molecular optical phenomena. The goal of our research is to understand how cells control the architecture of their intracellular organelle systems through the regulated self-assembly of lipid membranes and membrane-associated proteins. We employ both highly focused hypothesis tests and systems-level approaches that harness genetic, biochemical, and biophysical analytical techniques. MolES related research interests: Salmonellae translocated effectors (which are delivered across the phagosome membrane and recruited to the actin cytoskeleton, nucleus, and phagosome). The environmental remodeling of the gram-negative bacterial envelop that occurs when bacteria infect host tissues. Analysis of intestinal microbiome in cystic fibrosis. Characterizing Genes of Unknown Functions (GUNKs) important for envelope barrier in Acinetobacter bumannii. The Monnat Lab is interested in the molecular basis of human disease, and how synthetic and engineering approaches can be used to understand, treat or prevent disease. Our specific research projects have focused on cancer biology and therapy, and on building genome engineering tools to enable cellular and synthetic biology disease applications. MolES-related research interests: The Nance lab is focused on using nanotechnology based platforms (polymer, dendrimer, quantum dot) to understand transport limitations at the macro and micro scale in the central nervous system. We are particularly interested in using nanotechnology to characterize how common disease hallmarks, such as inflammation, impaired fluid flow, and excitoxicity, play a role in the ability to diagnose and treat neurodevelopmental diseases like autism, neonatal stroke, traumatic brain injury, and epilepsy. The Nath lab is interested in characterizing and controlling functionally relevant protein dynamics. We use a broad set of techniques from biophysics and pharmacology, including single-molecule fluorescence and molecular simulations, to better understand and engineer the behavior of enzymes and transporters involved in drug metabolism; emerging protein therapeutics; and aggregation-prone intrinsically disordered proteins implicated in major neurodegenerative disorders. The Nemhauser Lab is interested in understanding how signaling pathways fit into the broader contexts of time, location within an organism, and interaction with other signals. Specifically, we use a model plant called Arabidopsis thaliana to dissect the network by which seedlings change their form to take best advantage of their light environment. This process is called photomorphogenesis. Work from many groups over the past twenty years has produced a long list of factors linked to photoreceptors, the proteins that directly sense light and begin the process of photomorphogenesis. The goal of our research is to understand how these diverse proteins and small molecules create a robust and flexible network that shapes plant form. We harness our understanding of organic chemistry, polymer chemistry, and supramolecular chemistry to design stimuli-responsive materials for life science applications. Our current focus areas include polymer-living cell composite materials (also known living materials) and polymers to create anatomical models for human tissue. Our approach is to utilize the stimuli-responsive behavior of the materials to facilitate their fabrication or patterning. We are an interdisciplinary team of researchers, and our methods include polymer synthesis, rheological characterization, culturing microbes, and 3D printing. For more than a decade, my group has been interested in the identification and typing of common sequence variations in the human genome known as single nucleotide polymorphisms (SNPs) in an effort to gain an understanding of the patterns of sequence variation in human genome and to improve approaches for association mapping of common human diseases. In collaboration with a number of groups, we are exploring the genetics of cardiovascular disease risk in human populations. We are also developing and testing novel SNP and haplotype-based approaches for association mapping in humans, and we are exploring the relationships that may exist between genotype and trait expression at the RNA and protein levels in humans. Our lab is developing molecular agents and systems for photoacoustic and ultrasonic molecular imaging. Also, we look at integrated therapeutics for molecular-level theransotics (i.e., integrated diangostics and therapy). Our group studies the combustion synthesis of nanostructured material for application in energy and biomedical fields. We focus on low-cost production and self assembly of carbon and metal oxides aerosol gels. Next generation energy, information, and transportation technologies rely on materials that can withstand extreme environments. Reaching the intrinsic limit of materials performance in extreme environments demands an understanding of the atomic and molecular effects of physical and chemical processes in bulk structures and at the surface/interface of materials. Our group provides research and educational opportunities for expanding the scientific understanding of materials interactions with energetic particle fluxes (charged particles, photons and neutrons), electro-magnetic fields, chemical environments, and high temperature and heat flux. Our research efforts enable advances in materials science and create a scientific and engineering base for providing critical knowledge toward the progress of electronics for ultraviolet/thermal energy harvesting in space, space propulsion, fusion energy, and plasma-aided material synthesis. The Olson lab identifies, prioritizes, and advances therapeutics into clinical trials for children with brain cancer, with increasing focus on types of brain tumors that are uncommon and have the greatest need for translational research. We intend to increase the cure rate for children with these types of brain cancer by at least 10% due specifically to work done by our team. Prof. Marjorie Olmstead is on the faculty in the Condensed Matter Experiment group of the Department of Physics at the University of Washington, where she is Associate Chair of Physics for Undergraduate Affairs and Director of the Nanotechnology and Molecular Engineering Dual Title PhD Program. Research in Overney’s Lab focuses on obtaining a fundamental understanding of material functionalities involving nano-confined complex molecular systems. We are particularly interested in i) identifying basic internal and external constraints that are responsible for “unique” material and transport properties, and ii) applying knowledge of molecular- and nano-constraints to material engineering in a rational fashion, with focus on the molecular building blocks, their subunits, and their temporal and spatial mobilities. The Pauzauskie Lab focuses on the design, synthesis, and characterization of nanoscale optoelectronic materials with unique compositions and morphologies. The group’s ultimate goal is to help answer challenging questions in the biomedical, information technology, and renewable energy sectors by understanding how a material’s atomistic structure impacts subsequent properties and long-term performance. Of particular interest is the molecular surface functionalization of inorganic nanocrystals for engineering new theranostic nanomedicines. The overall focus of my research group is the use of theory, modeling and simulation to investigate fundamental and applied problems related to energy, materials and biophysics. Research in the Pollack Laboratory is focused on water science, water-based technologies, and water and cell biology. Water is said to have three phases – gas, liquid, and solid; but recent findings from our laboratory imply the presence of a surprisingly extensive fourth phase that occurs at interfaces. This finding may have unexpectedly profound implication for chemistry, physics and biology. The Posner Research Group’s focus is micro- and nano scale transport physics at the interface of chemistry, materials, & biology. Specific research topics include microfluidic and nanofluidic devices, colloidal science and interactions at fluid and solid interfaces, synthetic nanomotors, environmental and health impact of engineered nanomaterials, electrokinetics, low Reynolds number fluid instabilities, and fuel cells. Our research focuses on understanding and controlling self-assembly processes in dispersed colloidal, polymeric and nanoparticle systems. This fundamental knowledge allows for manipulation of material properties for applications in solar energy, nanomedicine, separations and advanced coatings amongst others. We also develop in-situ neutron and x-ray scattering techniques to formulate structure-property relationships under realistic processing and use conditions. Research in the Pun Group focuses on advancing macromolecule drug delivery technology by developing materials that overcome transport limitations in tissues and within cells. We are integrating techniques from engineering, chemistry, and cell biology to achieve this goal. Our research interests range from the genetic architecture of complex traits to the mechanisms of gene regulation. To address our biological questions, we frequently engage in technology development, often in collaboration with other investigators in Genome Sciences or elsewhere. Current projects of interest for the MolES Institute include (i) our exploration of chromosome architecture through tethering, (ii) enhancer discovery and design in plants, and (iii) a massively parallel analysis of double mutant and triple mutants across several genes of a pathway. The Ratner Laboratory’s focus includes the development of synthetic and biophysical tools to analyze glycan-dependent interactions at the surface of cells, tissues, and biomaterials. Leveraging molecular engineering, carbohydrate chemistry, advanced surface modification and analysis, and label-free biosensing technologies, Professor Ratner aims to unravel the roles played by carbohydrates and glycoconjugates in biological systems and apply this knowledge to engineer new molecular diagnostics and therapeutics. Our research focuses on sensory signal processing, particularly in cases where sensory systems perform at or near the limits imposed by physics. Photon counting in the visual system is a beautiful example. At its peak sensitivity, the performance of the visual system is limited more by the division of light into discrete photons than by biological noise or inefficiencies. This observation guides our investigation of the underlying mechanisms. The initiator of the cross-disciplinary Molecular Biomimetics field, Sarikaya’s major interests lie in peptide-based materials and systems in which bio/nano interfaces are designed to integrate biological structures with diverse functions of engineered solid materials. Selected through combinatorial mutagenesis and designed by bioinformatics, the interdisciplinary Lab has developed the genetically engineered peptides for inorganics (GEPIs). GEPIs are building blocks in directed/targeted assembly of nanoparticles and functional biomolecules; tiny enzymes, in biomaterialization, e.g., healing teeth; molecular linkers and erectors sets in biofunctionalization of surfaces, a potential key utility in molecular technologies and nanomedicine. The Sasaki group is developing novel medical and food/supplement technologies based on artemisinin, a natural product isolated from Artemisia annua L. Artemisinin is a part of the current standard treatment for malaria infection in humans. Artemisinin contains an endoperoxide group that reacts with intracellular iron to generate toxic radical species. Cancer cells undergoing rapid proliferation intake large quantities of the essential nutrient iron through up-regulation of transferrin receptor. Artemisinin has demonstrated highly selective cytotoxicity towards cancer cells in vitro and in vivo. We have found that the anti-cancer activity of artemisinin can be greatly enhanced by delivering the compound directly to the cellular iron uptake machinery. Also, dimers of artemisinin have shown highly potent anticancer activities that are equivalent to that of Taxol in cell-based assays. Recently, we discovered that artemisinin derivatives induce a specific down-regulation of survivin, an anti-apoptotic protein critical to cancer cell survival. The formation and function of electrochemical materials and interfaces are critically affected by molecular adsorption and templating. Our group explores the use of engineered proteins as modifiers of nucleation and growth, as well as orchestrators of hierarchical structures. In separate efforts, we also explore innovative methods to convert waste materials, especially lignocellulosic feedstocks, into value added products. The Human Photonics Laboratory (HPL) works to advance the frontier of optical technology in the areas of human performance, cancer detection, and treatment. The HPL has historical ties with the Human Interface Technology Lab at the University of Washington where the ideas for the immersive VR pain distraction, scanning fiber endoscope, and the optical projection tomographic microscope originated. Our group's research focuses on the development and application of novel x-ray spectroscopies to problems of basic, applied, and environmental energy sciences. My laboratory aims to decipher and manipulate the molecular mechanisms by which mammalian cells establish and utilize higher-order chromatin structures, with an emphasis on the interplay between noncoding RNAs (ncRNAs) and nuclear architecture. Towards this end, we are developing a suite of novel technologies for probing and exploiting ncRNA function in situ, including methods for targeting artificial ncRNA devices to chromatin. Combined with an array of biochemical, genomic, and chemical biological techniques, we aim to elucidate the mechanisms by which ncRNAs influence nuclear organization at all levels. This will enable new routes towards novel RNA-based and RNA-focused biotechnologies and therapeutics. Our lab investigates how cells are influenced by mechanical interactions at the micro and nanoscale. To pursue these goals, we are developing new tools – micro- and nano-devices, quantitative image analysis, and computational models – that we use to understand the underpinnings of biomechanics and mechanobiology. The greater impact of our work is to delineate how cell mechanics affect cardiovascular disease and cancer in order to catalyze new strategies for their treatment. By working at the intersection of mechanics and biology, we are increasing understanding of the theories of soft, active, and multifunctional materials. Research in Dr. Sokurenko's laboratory is focused on understanding mechanisms of molecular adaptive evolution of genes in bacterial pathogens. Professor Stahl’s group studies microbial community structure and function in many different habitats, including aquatic systems, extreme environments, animal guts, the human mouth, and contaminated systems. Molecular engineering-related research interests include electron transfer systems sustaining microbial food webs, adaptive evolution of synthetic microbial communities, and biological catalysts for the oxidation of reduced nitrogen species. Our group is interested in elucidating the fundamental mechanisms of biomolecular recognition and applying the unique capabilities of biological molecules to biotechnologies. We would like to bridge the gap between understanding molecular structure-function relationships, and to be able to utilize proteins/peptides/DNA for in vivo drug therapies, bioseparations, diagnostics, and biomaterial development. Our goal is to hijack and rewire aspects of nature’s developmental programs to control the processes by which cells assemble to form human tissues. We are also working to develop technologies to remotely control these tissues after implantation in a patient. To do this, we use diverse tools from stem cell biology, tissue engineering, synthetic biology, microfabrication, and bioprinting. We seek to translate our work into new regenerative therapies for patients with heart and liver disease. The UW Electrochemical Surface Science (UWESS) group examines surface science phenomena related to electrochemical situations, with an emphasis on fuel cells and related technologies. Current projects include electrochemical reforming of biomass to hydrogen, density functional theory of water adsorption and diffusion, the role of electric field in water ionization and surface reactions, and oxidation reactions in hydrocarbon-fueled solid oxide fuel cells. In the area of molecular engineering, the Taya Group is interested in energy-harvesting based on thermoelectric semiconductors (both inorganics and organics), dye-sensitized solar cells, and electrochromic window with switchable dye molecules. The Thomas lab studies regulated adhesive proteins. While we study protein allostery in general, we are particularly interested in mechanical regulation. A main interest is in “catch bonds” that are activated to bind by tensile mechanical force. In particular, we study mechanical regulation of proteins involved in bacterial infection and thrombosis. We also engineer smart regulated adhesives. In our “actibodies” project, we design activatable, antibody-like recognition proteins. In our “biocatch adhesion” project, we integrate catch bonds into adhesives that will allow medical robots to catch human tissue under force, and then release it, like nanoscale locking seatbelts. The research in Dr. Traxler’s laboratory focuses on the genetic and biochemical analysis of protein folding and function. Recently, the lab has been involved in the development of materials for nanotechnology. Different proteins characterized in the lab’s genetic analyses are being engineered by the addition of polypeptide sequences that bind to various inorganic compounds. Those inorganic compounds can be arranged in predictable structures, based on the self-assembly properties of the substrate proteins. Examples include using different DNA binding proteins to organize inorganic nanoparticles along a DNA guide. We are interested in probing the structures of membrane proteins and their complexes, and understanding the molecular basis of their biological functions. We have developed a novel and general method, called “random spherically constrained” (RSC) single-particle electron cryomicroscopy (cryo-EM), to study membrane protein structures in membrane environments. This method does not rely on crystallization, and it can be, in principle, applied to any membrane protein. It not only preserves the membrane protein’s integrity and native conformation, but also enables access to biologically interesting states. The Woodrow Laboratory is focused on the applications of engineered biomaterials in mucosal infections and mucosal immunity. Our long-term goals are to design and build multifunctional materials that will: (1) lead to novel preventative strategies against mucosal infections, (2) program protective immune responses at mucosal sites of pathogen entry, and (3) facilitate studies of mucosal infections and mucosal immunity in health and disease. These scientific goals are addressed from the perspective of fundamental science, technology development, and translational research. We use high resolution live imaging and total internal reflection microscopy to study molecular motors and their role in mitotic spindle assembly and chromosome movement. At the single molecule level we evaluate motor control of dynamic microtubule assembly and disassembly. Of special interest are the forces driving oscillatory chromosome movement, mitotic spindle assembly and mitotic spindle orientation in live cells. Finally, we are interested in the advection of motors in live cells. In other words, how the kinetic parameters of single microtubule motors influences their translocation, distribution and function in cells and we are interested in modeling this activity in silico. The goal of our research program is to combine the optical spectroscopy, transport measurements and nano-device fabrication techniques, to understand the electronic and optical properties of quantum confined nanostructure, develop the probe and control techniques of charge and spin, and the quantum physics in these confined nanostructure, push the unification front of material synthesis, device fabrication, physics measurements, understand the physics arising from this process, and push the knowledge and techniques we learn from these study back to the application frontier, such as optoelectronic, spintronics, optomechanics and plasmonics. Professor Yager’s research interests lie in the areas of: microfluidic devices for chemical and biochemical measurement., development of point-of-care diagnostic instruments, microfabrication technologies for microfluidics, and development of microfluidic-specific methods of analysis of biological samples. The Yang Research Group uses various experimental and theoretical techniques to study materials of great fundamental and application interest. Current research focuses on the design, synthesis, testing, and understanding of advanced thermoelectric materials and Li-ion battery materials for energy conversion and storage, which include electron and phonon transport of thermoelectric materials, thermodynamic stability, atomistic structural arrangement, electronic band structure, and lattice dynamics of nanocomposites, and degradation mechanisms of advanced Li-ion battery materials. The Yu Group focuses on two research areas: solar energy and biosensing. We synthesize new semiconductor nanomaterials for hybrid photovoltaics and utilize plasmonic nanostructures for enhancing light harvesting and conversion. We develop plasmonic nanostructures for surface-enhanced Raman spectroscopy (SERS) and new sensing platforms for chemical and biological sensing and detection. The Zalatan research group seeks to understand how biological signaling networks are organized at the molecular level to process, integrate, and coordinate signals. We focus on individual reaction steps at key decision points in cell signaling pathways, using a wide range of tools from biochemistry, enzymology, and synthetic biology. This approach allows us to draw connections between molecular events and cellular behaviors, providing a framework to identify new drug targets and to engineer synthetic pathways for cell-based therapeutics and devices. Protein, cell, and biomaterial interactions; biocompatibility assessment; protein and cell micropatterning for biosensing and BioMEMS applications; biomaterials for tissue engineering and regenerative medicine; controlled drug delivery; nanotechnology for cancer diagnosis and therapy.